Thread: Rolex Oyster Perpetual models. Does anyone here own one? And given the availability issues with Rolex, are these easily available at ADs? I’ve not had the chance to try a white one myself but was in my local AD a couple of weeks ago trying the 36 and 39 sizes in other colours. Apparently all sizes and colours of the OP are available to order with a few weeks notice. I really wanted to swap my 16570 for one but without the easy link extension I thought better of it. 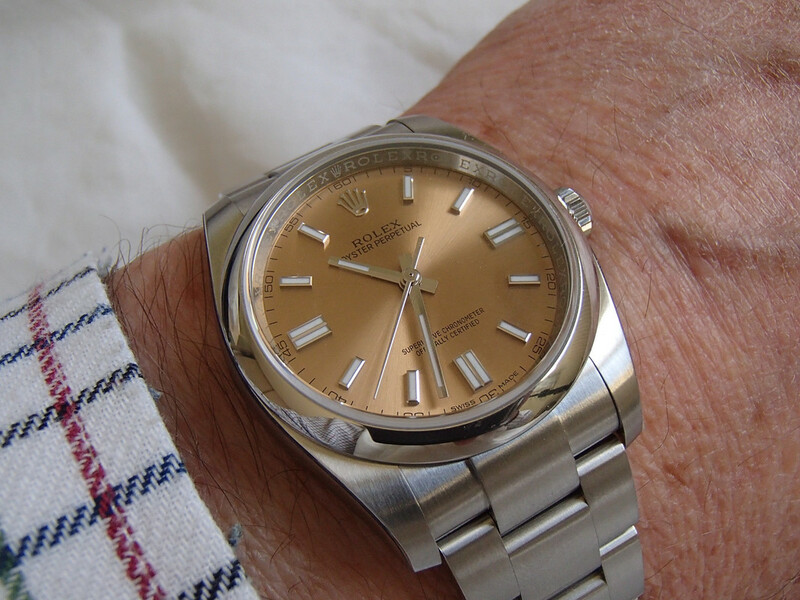 My favourite Rolex but it would have to be the 36mm version for me. In fact, its the only Rolex in the current collection that appeals to me. Last edited by JeremyO; 11th February 2019 at 09:09. 36mm is best size imo. I love the new white dial. And ghe black. And the blue with 369 dial. 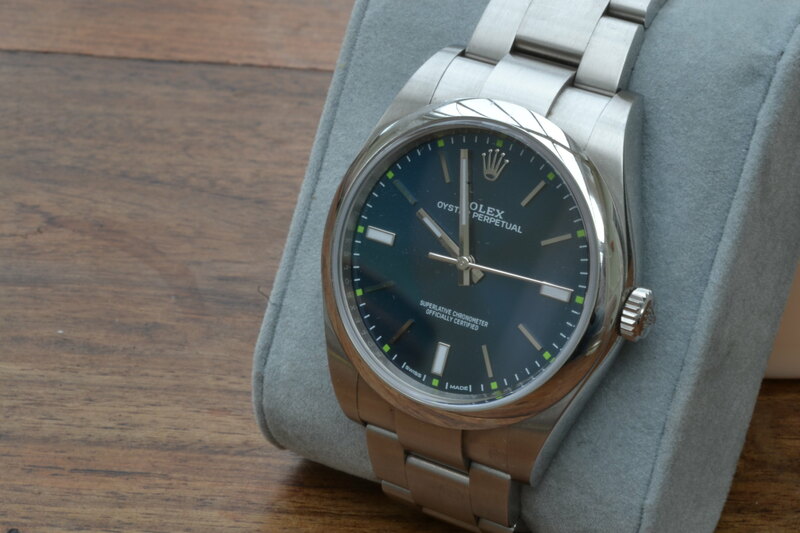 I seriously considered a 36mm Oyster Perpetual last year, loved the blue dial with 3 6 9, but the case is a little more chunky and the bezel has a domed curve which I didn't like, so I finished up buying a 114270. No white dial explorer so perhaps an unfair comparison, but I much prefer the explorer case and bezel. 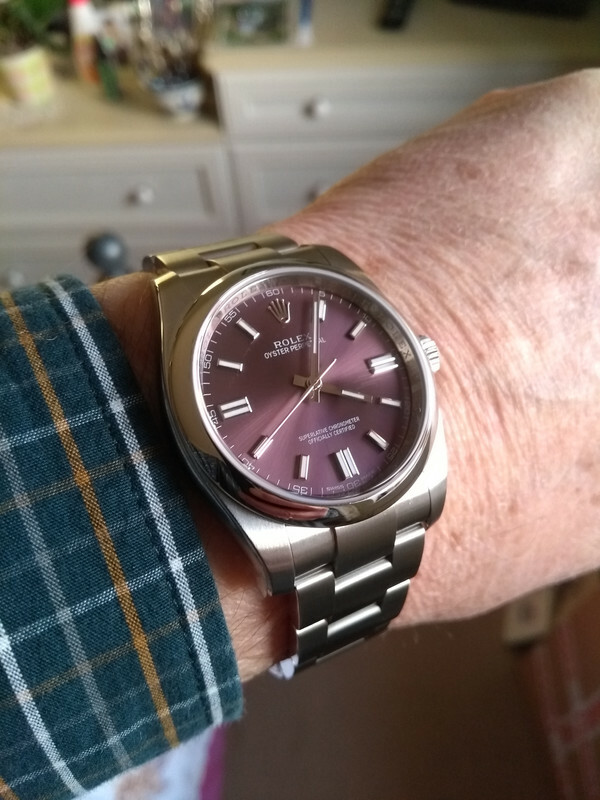 I tried a datejust 36mm last week & although it was very comfortable it looked diminutive on my not very large 6.5" wrist. However the datejust 41mm was a little too large. Maybe the OP 39mm would have been the better fit. Believe the DJ has polished lugs and centre links and OP has brushed lugs and centre links, if that makes a difference to you? I have a blue 39mm OP. It's a favourite, and I wear it a lot. Easily available, and at a discount if you haggle. 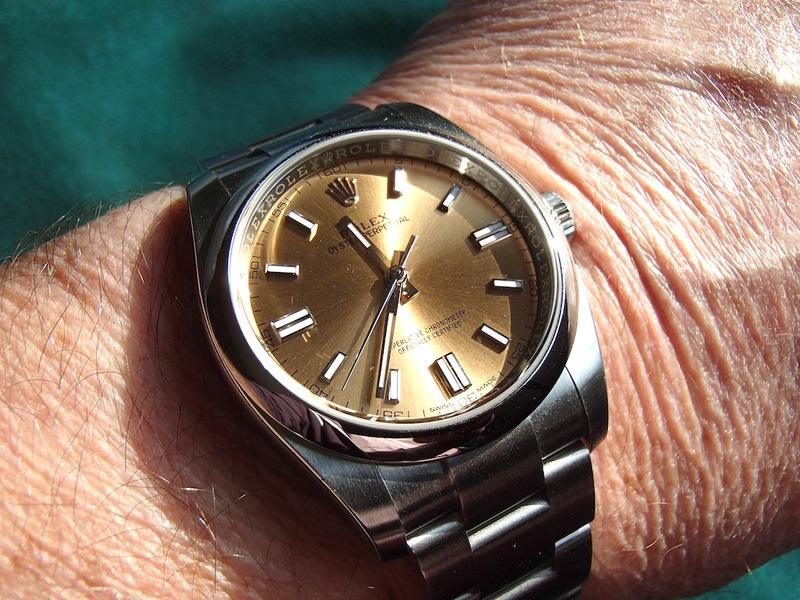 None of my Rolexes have any adjustment in the bracelet, and I can't see why you'd ever need it. I really like the new black one, but I can't justify getting another one to myself. It could easily be an "only watch". It's pretty low-key for a Rolex. Last edited by Holsterman; 11th February 2019 at 01:19. Correct, and I think the polished lugs spoil the design, especially on the bimetal versions. 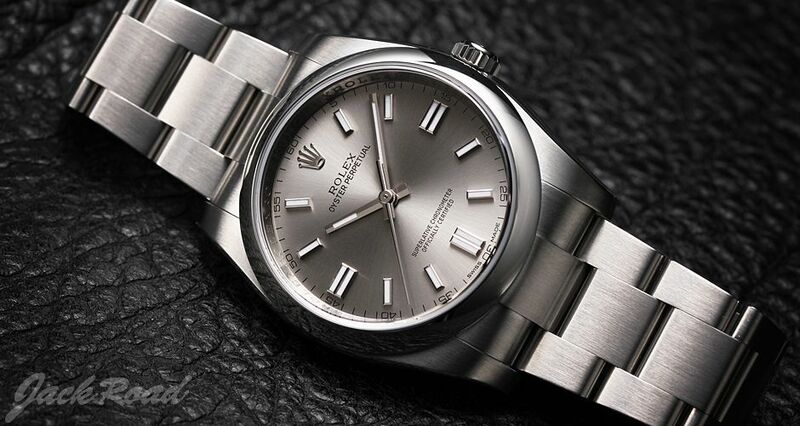 Too many contrasting surfaces/ finishes IMO, the Oyster 36 is far more faithful to the classic Rolex design concept. 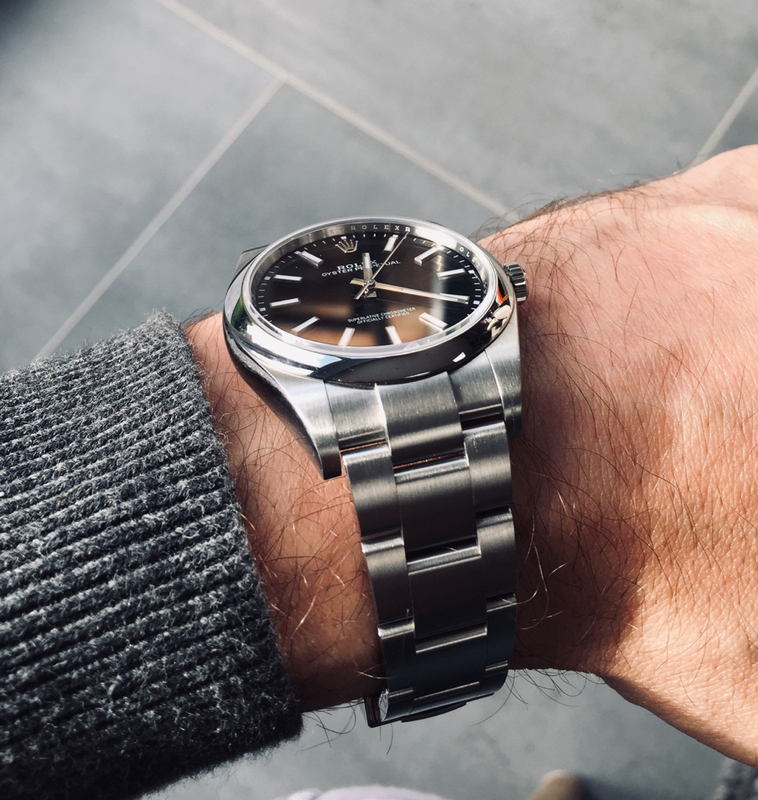 I like the Datejust, I owned a steel 116200 smooth bezel/ Oyster bracelet version for a while and regret parting with it. I almost bought the same watch in bimetal but didn’t, with the right dial colour I still think the watch is nice, but I can’t help thinking the older pre 2006 design with slimmer brushed lugs was better. The 116000 Oyster 36 with blue 369 dial is a favourite of mine, if I buy anything this year that’s what I’ll buy.......second- hand at the right price would be tempting. Not for me, the polished centre links and the cyclops hold no appeal. If I were buying new I would wait until after Basel '19 to see if Rolex start to put some of the new 70h power reserve movements into the smaller Datejusts or the Perpetuals. A 36 Perpetual with a 3235 movement from the 41 Datejust would be awesome. The lug change on the Datejusts is less commented on than on the sports models but the result is a similar loss of elegance compared to the older design, with the 34 and 36mm models being the worse affected imo. A few months back I allowed myself to be half tempted by a 34mm OP but, apart from balking at the price, the almost rectangular case shape was a deal breaker. The bezel design changed in 2006, along with the fatter lugs etc. The current style is more rounded and from some angles looks quite different from the earlier one. The biggest improvement on the post-2006 models is the bracelet, which is a definite step up. More importantly, it's possible to get a better fit than with the earlier Oyster, the 6 side can be made a little shorter than previously and that helps folks with smaller wrists. 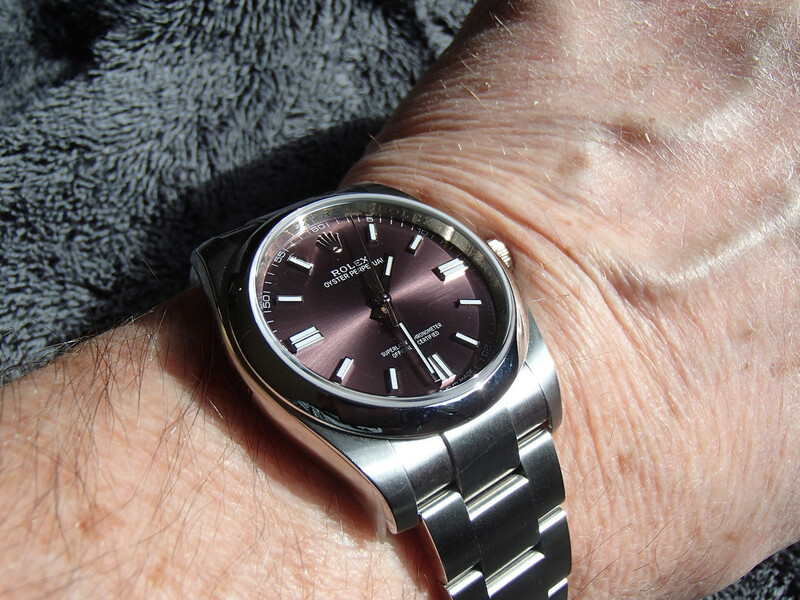 Until recently I owned a 114270 Explorer 1, a nice enough watch but I was never 100% happy with the fit of the bracelet. If the 6 side had been a couple of mm shorter it would've sat better on my square wrist. I suppose with the fatter lugs there is more metal to polish away. Just think in ten to fifteen years, it might look right! 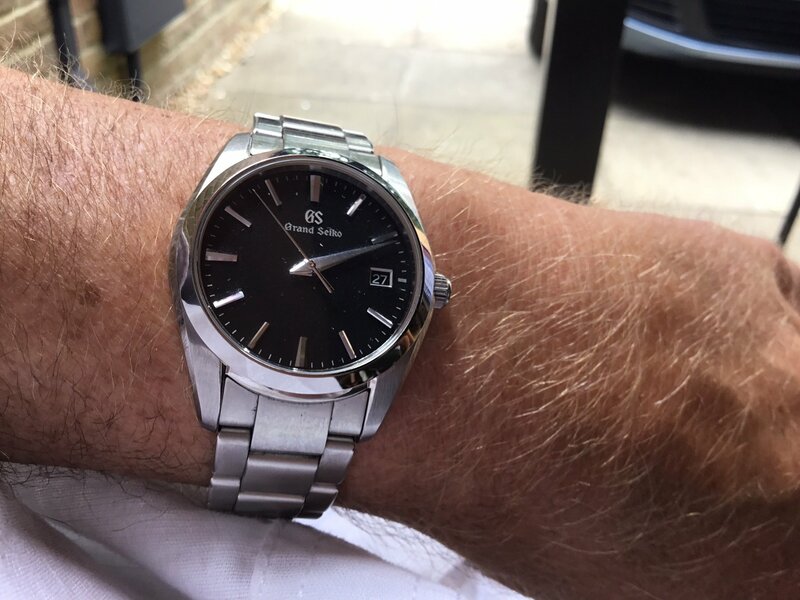 I have the 39mm OP with rhodium dial, just the right size for me, very understated, doesn't shout 'Rolex' could be the 'one watch' solution if l ever manage to cure myself of this watch obsession! That's my favorite new Rolex. I'd buy one if if I weren't certain my wife and friends would hate it. I love these models, especially the blue and grape variations. Both are wonderfully understated and perfectly sized. 36 works great for me, but 39 doesnt look too bad either! Does anyone here own the 2018 white dial? Not white but new black dial...fantastic watch and real comfy on the wrist. No easylink extension but i rarely use it on my DJ41 so not a deal breaker. I think the 36mm is a nicer proportioned watch personally. Yes the 36 has much better proportions the case and bezel on the 39 seems so much more chunky ! 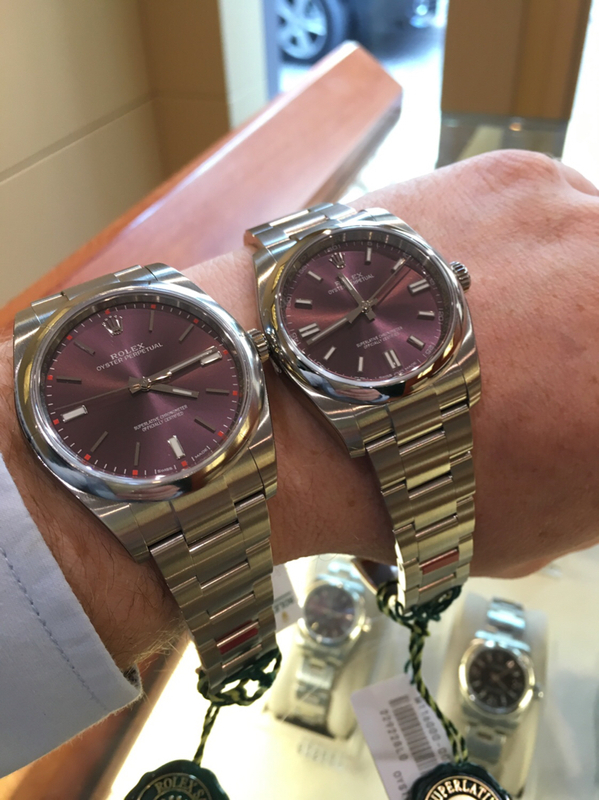 I agree, the 36mm does feel better proportioned, now need to find an AD that has one in stock to try on. My local AD doesn’t have any white dials so may need to visit a few ADs in London. Thanks for all the advice here. Just to update, I went to my local AD a few days ago to enquirer about the 36mm white OP. They told me that they have only had 2 of this model over the year and would be difficult to source. Is this right? I can understand the demand for the sports models, is this having a knock on effect on the other models in the range? Has anyone seen the white 36mm at an AD? I was told something similar when purchasing a OP39 with black dial. I just rang all the AD in my area until I located one. Just viewed a ‘Watchbox’ video, giving info on the most viewed models on their sales site (a sort of US Watchfinder). The most viewed was the cheapest Rolex....a 34mm women’s OP. As for the 36 v 39mm; I prefer the 39mm. A more usuable size overall, certainly there seems more demand for them. My partner wears a 34mm (olive green) and sometimes a 37mm Grand Seiko. Although she’s small, the 37mm still looks a better size, if only because a larger dial is easier to read at a glance. Do like that olive dial. Sort of a junior Milgaus.Here’s a 37mm Grand Seiko. 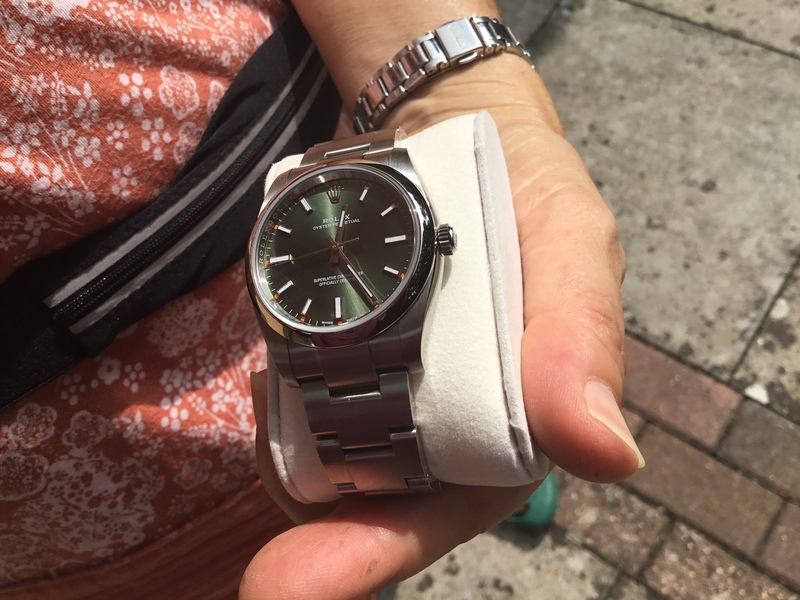 So, 37mm on a slim woman’s wrist looks good, at least to me. Here’s the same 37mm on my hairy wrist. 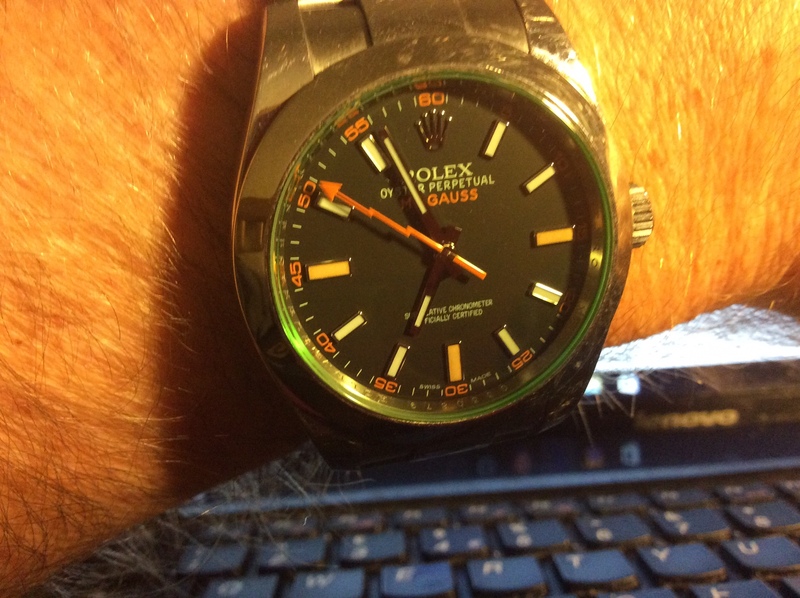 And here’s a 40mm Milgauss. You can see how it influenced the design of the current OP range. They’re a ‘toned down’ Milgauss. Writing this has made me realise that, as someone who doesn’t mind quartz, I prefer the 37mm GS to the 36mm OP. At under half the price. To my eyes, it’s equally well-made and better looking. Treachery! Last edited by paskinner; 22nd February 2019 at 09:49. 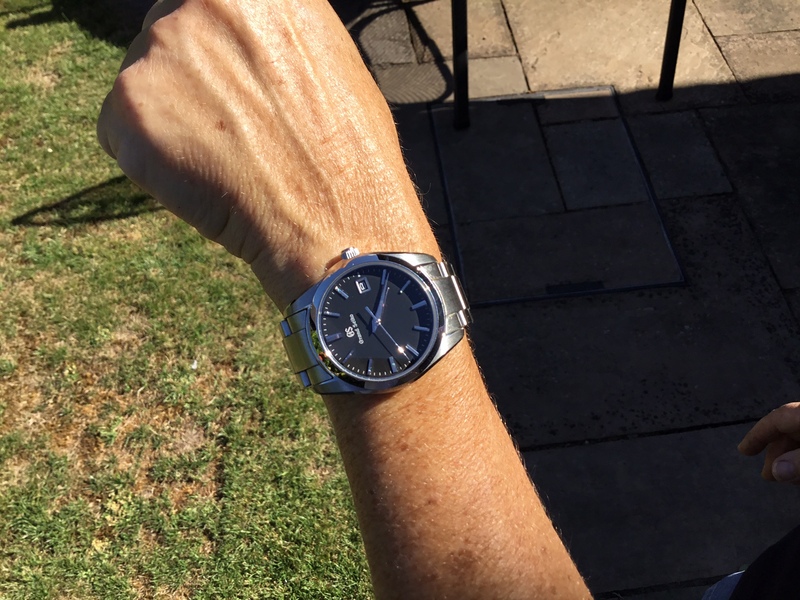 I tried on the 39mm a few months ago and was left a bit underwhelmed. It's nice but not £4K nice compared to the alternative. The staff were more interested in the 6424 I was wearing at the time. I am quite taken by these. Normally I don't like any dress/non sport Rolex but the simplicity of the op, particularly in white or black dial, I like. Wish they did the white dial in 36mm with 3,6,9. That would be the one for me. Too close to an explorer though for Rolex to make that I guess. White 39mm in window of goldsmiths intu Watford this morning. I was thinking the same thing. The oversized watch thing seems to be going out of fashion, thank goodness. I was also thinking it was far too big at least in that photo as sometimes the photos don't show a true image. A 37mm drivers watch a with a bezel might look better for her as it's not all dial? I’ve to agree. The 37mm looks massively oversized in that picture. I like these but the lug width looks huge. Is 20 or 22?